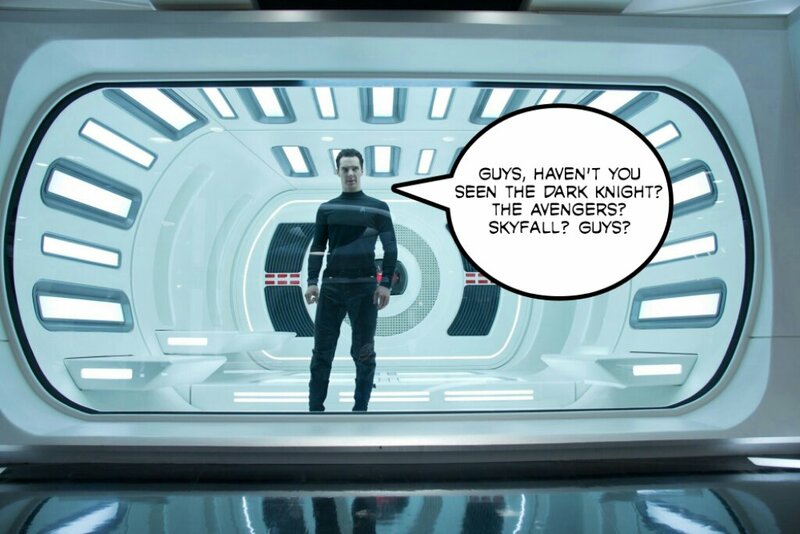 Star Trek Into Darkness – Review – Screenkicker! I’m going to keep this short. Not because all these long weeks of reviewing have left me a burnt out husk but because there’s already a million other reviews out there for this movie. If you’ve already scrolled down to see the score hear me out. I have been a bit harsh but that’s probably because I was expecting more than what I got so hear me out and then you can all tell me I’m wrong. 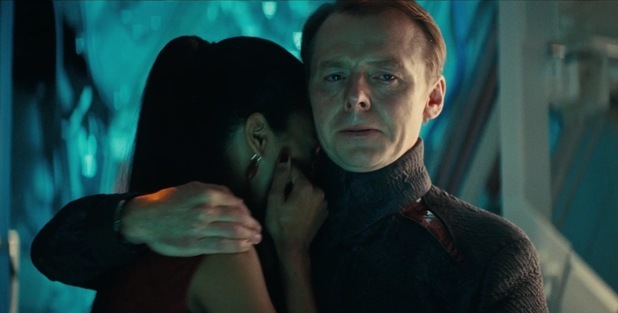 Star Trek into Darkness (STID, you can get a cream for that) has the crew of the Enterprise going after a terrorist named John Harrison who is hiding in a cave on a desolate planet Bin-Laden style. Throughout the course of this manhunt some secrets come to light and lots of stuff blows up. That’s the poster quote for you JJ. 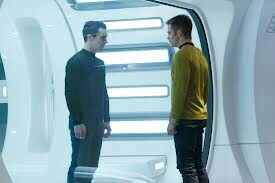 First things first, Into Darkness is not as good as the previous Star Trek outing. There’s nothing here you haven’t seen before in other Sci-Fi films. 2009’s Star Trek had it’s huge rug-pull of a plot to bowl over audiences, something that Into Darkness doesn’t have in it’s Arsenal. The twist in the previous movie was like a clean slate, a break off from the old series that made us feel anything was possible in future. That film had real (space)balls so it’s sad that Abrams and writers Lindelof and Orci don’t have the courage to follow through, instead falling back on nods to previous Trek moments. There are even scenes that blatantly mirror classic Trek scenes when all we want is new material. Despite this the cast is excellent this time out particularly Chris Pine and Zachary Quinto as Kirk and Spock. Not everyone matches this with Simon Pegg’s awful Scottish accent only slightly better this time and Alice Eve’s character seemingly just there to rattle off plot points and look hot (which she does well by the way). But all the plaudits should go to Benedict Cumberbatch as Harrison. He makes his character enigmatic and scary. Dressed all in black and speaking in deliberate tones before showing himself as a hard-as-nails badass he pretty much steals the movie. The problem is that there’s not enough of him. Oh that and his plan doesn’t make a whole lot of sense. But ignore me, I’m probably just in a lousy mood. 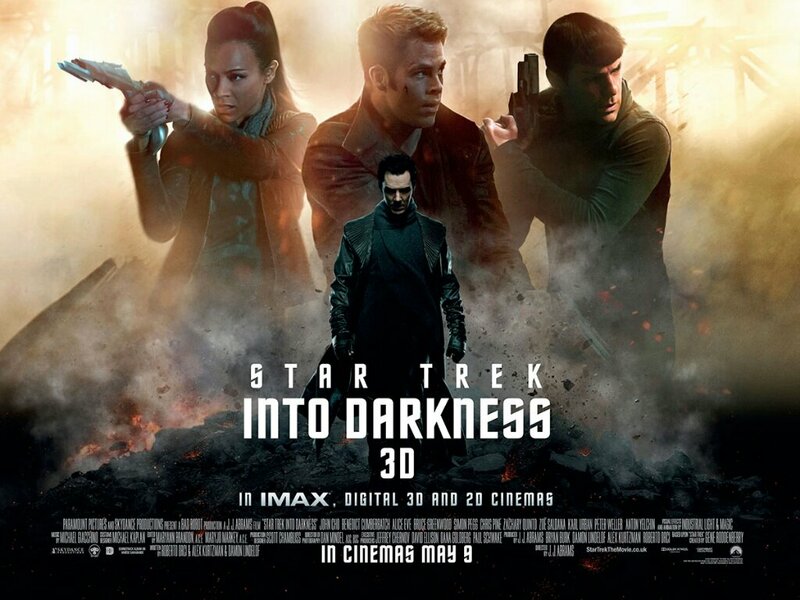 Into Darkness is a good action film disguised as a Star Trek film. For a Science-Fiction movie it doesn’t have much science in it which is kind of what Star Trek should be about. What you have is a fun, big budget, well acted movie that you’ll no doubt enjoy if you don’t think too much about the plot. I’ve just remembered I said this review would be short. Must be a dodgy warp core. Next Halo: The TV Show – It might be good! I’m glad you knocked it down a few points as well. The more I think about it, the more I do not like the film and the plot’s stupidity only insults our intelligence. Love the characters, wish the story was completely different. I’m not a Star Wars fan at all, so I have no expectations or excitement lol. I liked it quite a bit. Falling back on familiar themes and plots has always been part of Star Trek. How often did they use time travel? Lots of time. Science? New ship with the ability to overtake a ship while in warp drive, chrigonic freeze chambers that work for over a century, a device that freezes a volcano. Besides Trek has been more about people of different varieties dealing struggles more than being tech heavy. The best episodes were basic themes taken and updated into a future setting, but they were still more about feelings and a purpose. I think the new film is along those lines too with Khan being dedicated to his “family” and Kirk and Spock trying to find themseleves along the ways. Great review of a polished turd. Good review Mikey. Fun for all that it is, and that’s because Abrams is one of the most capable directors working today. I do agree with your review but any perceived plot weakness does not in any way detract from your enjoyment of the film. Go see it!! I just watched this last Tuesday I think and I agreed you mainly. Only that I gave 8/10 just because of Cumberbatch was so good. And I was entertained. But yeah, the writing should’ve been better. And the previous one was better (was Pegg’s accent like this in that one? It’s horrible.). Haha yeah I live in Scotland and no one sounds like that here! Glad you enjoyed it. More Cumberbatch would have been good!